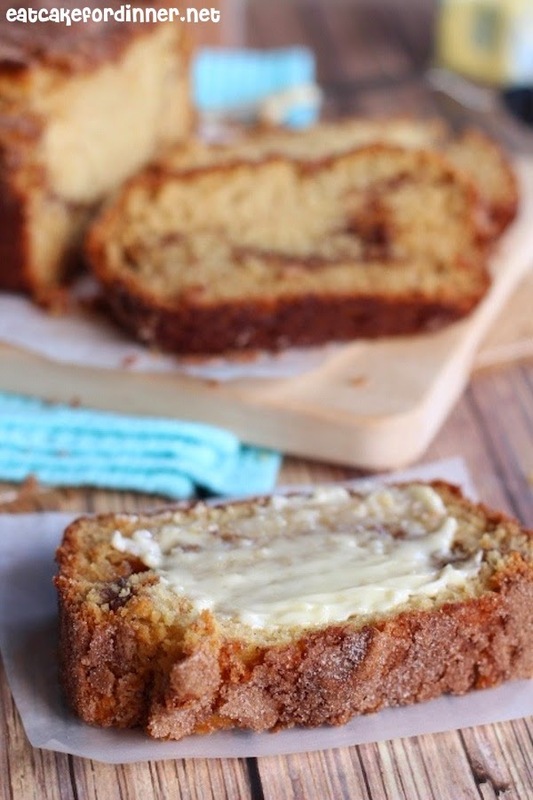 Have you ever had real Amish Friendship Bread? The kind that is made with a "starter"? It is one of the best breads I have ever eaten, but it isn't a bread that you can jump up and make the second you get a craving. The "starter" takes at least 10 days to be ready. Check out this post if you are interested in the original version. 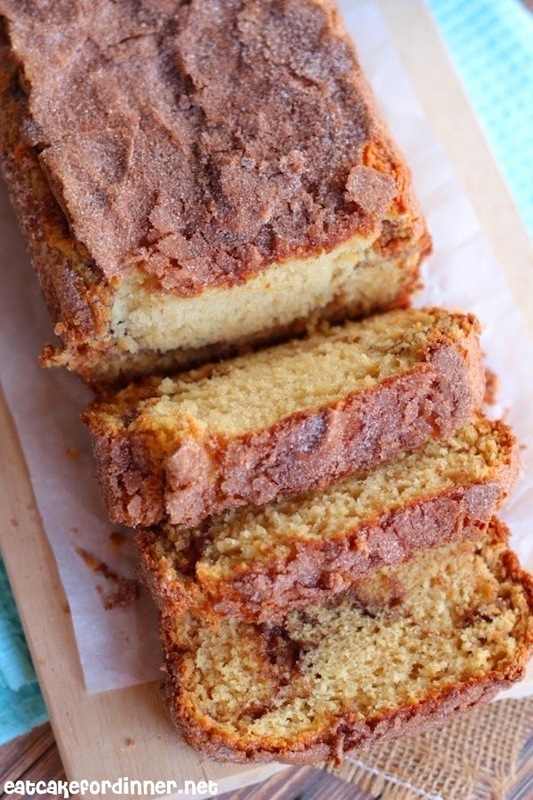 I pinned a recipe a long time ago that claimed to be just as good as Amish Cinnamon Bread. I tried it once as mini loaves, but filled the pans too full and it wasn't very pretty. Months went by and I finally tried again, but as a regular loaf. It turned out so GOOD! Whether you eat it warm with butter or at room temperature, it doesn't matter, it will be delicious. It is so soft and moist and I even used half butter and half applesauce. 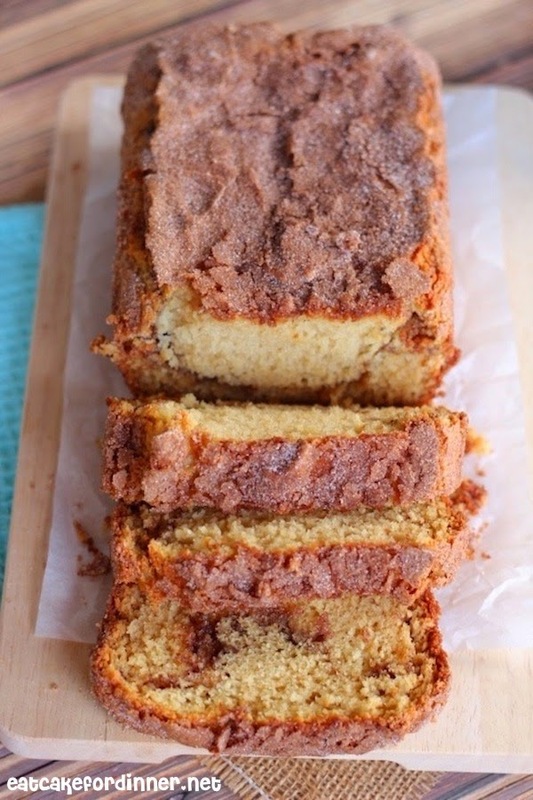 The cinnamon sugar crust on top will have you going back for slice after slice. Now, this isn't quite the same as actual Amish Friendship Bread, but it is a good alternative for when you get that craving. Next time, I am thinking of cutting back on the sugar and adding some vanilla pudding mix instead. If you try it let me know what you think. Preheat oven to 350 degrees. Cream together butter and sugar. Add the egg and vanilla and mix to combine. Add the buttermilk, flour, baking soda and salt and mix until just combined. Spread half of the batter into a greased 9x5-inch loaf pan. Sprinkle 3/4 of the cinnamon sugar mixture over the top. Gently spread remaining batter over the top and sprinkle with remaining cinnamon sugar mixture. No need to swirl it with a knife, but you can if you want. Bake for 48-50 minutes or until a toothpick inserted in the center comes out clean. Allow to cool in loaf pan for 15-20 minutes, then run a knife around the edge of the pan and invert to a wire rack and cool. Makes 1 loaf. Really? You have got to try it. The original version is fun when you have friends to share the "starter" with and when you have the time to do it, but this alternative is great for a quicker version! Thanks for the pin. I have had REAL Amish Friendship Bread and it is out of this world good!! This also looks delicious!! I'm pinning it to try!! Thanks Jenn!! I know, huh! The REAL thing is really out of this world! Thanks for the pin. I've never even heard of this but it looks amazing!! It is such a good bread recipe!! You should try it sometime. Thanks. Jenn, I love recipes that can be made right when you get that craving! 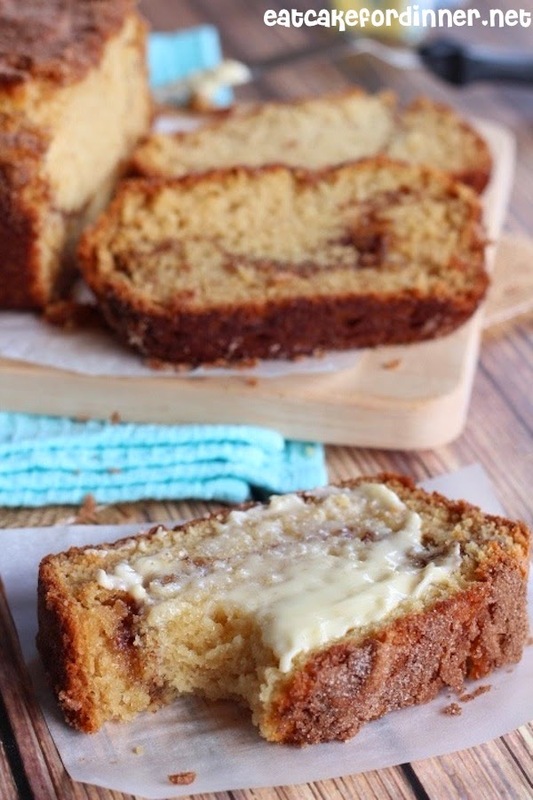 This cinnamon action looks divine! Yes, lots of cinnamon action going on!! Thanks. This bread is so good. When I made it last time I had to use vinegar and skim milk in place of the buttermilk. I have real buttermilk today and I bet it will be even more amazing. Love this recipe. Thank you! Would this recipe work in a 13x9 pan? or should I double it? I made this and the texture was beautiful. Got lots of compliments. Nice one! So glad to hear!! Thanks for letting me know. This recipe was delicious! I made it with a few vegan tweaks and it was still amazing! I subbed ground flaxseed and water for the egg and subbed in almond milk with apple cider vinegar for buttermilk and then i subbed earth balance vegan sticks for butter. That is awesome! Thanks for the tips on how to make it vegan. Reminds me of the bread they had at Costco around Christmas. It was so good! I printed this one and will be making it this weekend. Thanks for the recipe. Can you make this as muffins in a muffin tin? I sprinkled cinn./sugar on bottom of greased pan. Very lightly I hay add. I made it. Did not care for it. Kinda bland. I will try again. I maybe messed up.Thanks for letting me try your great recipes! I'm so glad you liked it. Thanks for letting me know. What type of applesauce did you use? I made this recipe years ago & never commented! Anyway, I came back looking for the recipe to make it again (this time I will double it for our family)... that should tell you how good it is! Thanks! I substituted Bobs Red Mill (1 to 1) Gluten Free Baking powder instead, and it worked out really well. I'm wondering if I should have added a little baking powder to make it rise more. The taste is wonderful especially if you're a cinnamon lover!